On Court Interview I took with my iphone tired of not having the on court interviews up.. I really like them! Rafa does a blog for The Age .. I guess it's 2012 & Rafa wants a change from his normal blog at the Times & HeraldSun.. Practice photos from Jan 16 Can be viewed over at I HAVE A TENNIS ADDICTION tennis enthusiast Steph She has many photos of Rafa training. Champions Drink Responsibly updated theit facebook page with Rafael Nadal. photo of Behind The Scenes & They also posted a video of Rafa's near miss!! Espíritu Ganador Banesto- Entrevista a Rafa Nadal.1. 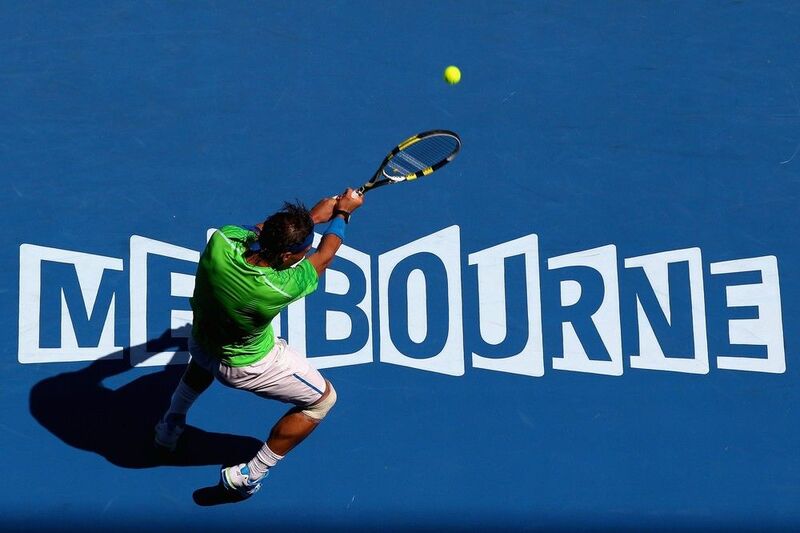 Open de Australia 2012. ''It gives you a little bit more power. That's all. It's three more grams. Three more grams probably on the side of the racquet doesn't feel for changes. But three more grams just on the top of the racquet makes a change." "Things are fine between us, you know. I have no hard feelings towards him," said the Swiss superstar, bidding for a fifth Australian Open title. "I always had a fantastic relationship with Roger. I still have a fantastic relationship with Roger." said Nadal. 'I was out of the tournament' - Rafa reveals how he thought his AO run was over.